Greetings, dear makers of Batman fan films! Long-time fan and admirer here. My name is Yan Eden and I really wanted to share this very personal fan project o'mine with you! Hope you enjoy it! - includes an original script, great vocal tracks from such talents as Jay Nelson & Mark Hamill himself. 4 days after the release of my video... what a wonderful coincidence, truly amazing too! 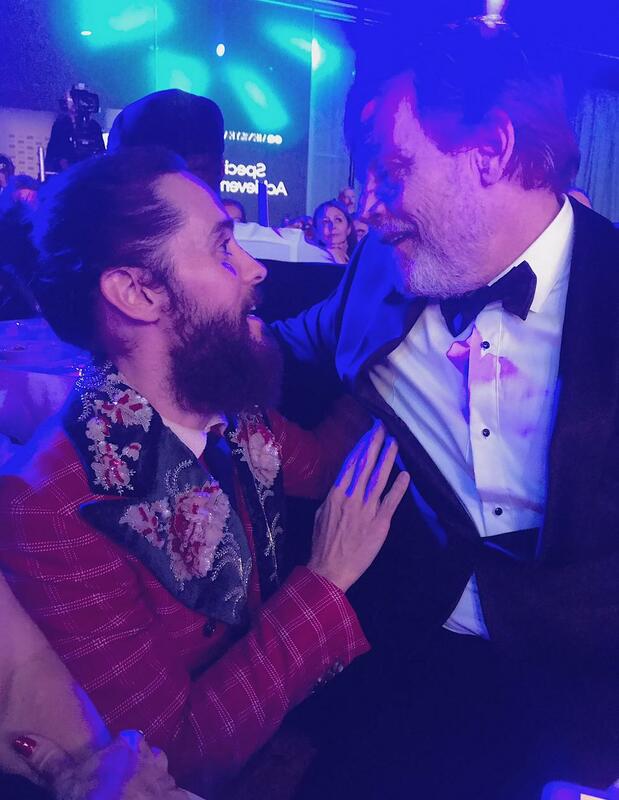 Mark Hamill: "@JaredLeto's kind words choked me up! #Thanks"
Dear Batman Fan Films users (new and old, Joker fans, Batman fans, Batman: The Animated Series fans, DCEU fans, fans of a wide range of mediums), can I ask you all for a simple favor: can more of you, please, spread the word about our Joker project through your online platforms (be it Twitter, Tumblr or whatnot)? 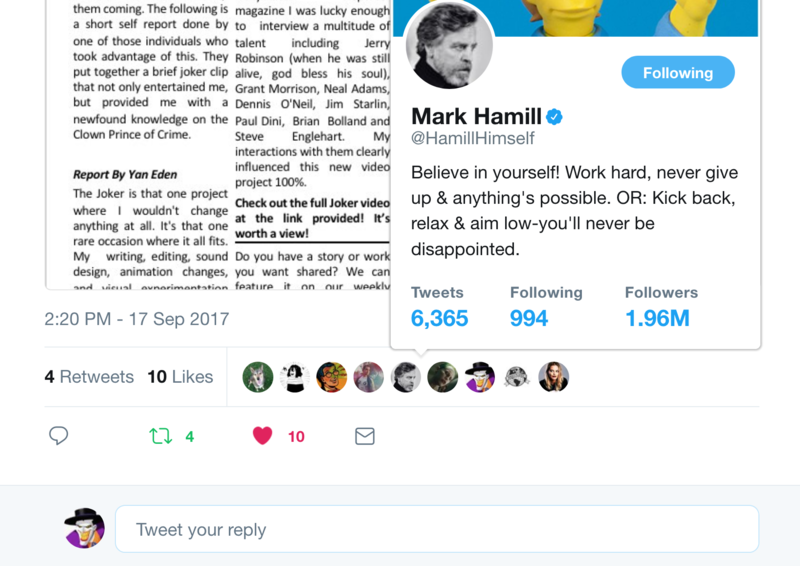 You see, despite all of our hard marketing efforts and promotional attempts (tweets, FB posts, conversations within different communities), it seems to us that a lot of people still haven't seen it, or they prefer to ignore it (like a lot of famous comic book websites, self-appointed afficionados and YouTube brands that are considered to be 'comic book experts' with their predictable green screen schemes and little microphones), or just don't know about the project's existence (which is highly unfortunate, considering how much energy, love, tenderness and passion went into this: mere 1,333 views). 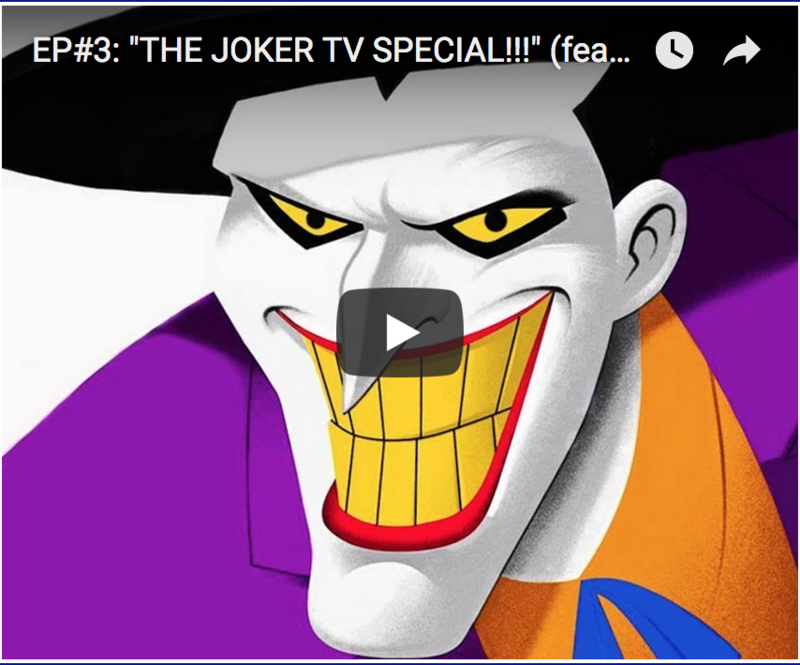 Can some of you, if possible, create a certain presence for this Joker video throughout your friends and other neighbors? 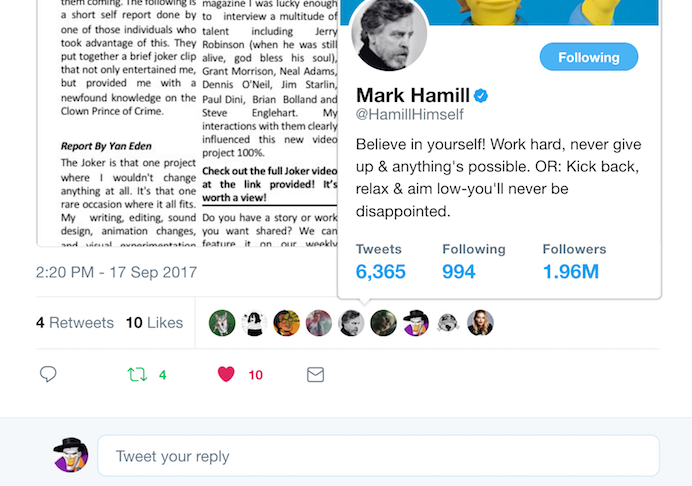 If it was not for the quality and for the people involved (myself, Mr. Jay Nelson & Mr. Mark Hamill), I wouldn't utter a single world, but since it's the 21st century that we all live in, I need to make sure that we get heard and seen. Marketing myself more effectively seems really like a tough nut to crack, you see: I did a lot of promotion on Twitter & Instagram services, and yet, despite all the hard work and a high level of craftsmanship, this video project is not getting enough attention as it should. After 9 days of constant promotion and big marketing push, my current result is still only some 1,333 views. In the old YouTube days, that could've been considered as a small victory of sorts, but now, we live in a very different age, where it's mostly about provocation and other wild things that are way beyond my understanding. Which is really sad, because I feel that this project in particular deserves more appreciation (with all of our production values involved), more attention and more coverage from a lot of other comic book websites, but, apparently they do not think the same way and see our efforts as something that has to do with competition, not partnership and a mutual understanding. And Patreon... I just cannot do it. I cannot ask people to support me for a fixed price (seems rather strange to do it) or feel like I was forced to do the whole loan-taking thing and then when my product will be finally released, people will ask for their money back. The thing about FB is: for example, you spread the word, you let them know you are ready for an intelligent discussion, you hope that amongst 30000 members of one community (just for the sake of it), at least half of them are going to interact with you and let you know what they thought about your latest work, but instead, all that you get is some 5-7 likes at best, which brings into question the rest 20000 + something members that are occupying the group's space. I am telling you, as a former journalist myself, seeing how everything has transformed over thee last couple of years and became all about brand-marketing and personality-advertising, instead of concentrating on the quality of the released product itself, is very mind-boggling. Then again, Miller's Death of a Salesman never stopped being relevant, so you have to also take that into a consideration. Thing is, there's just too much competition on the market right now, and that very competition with its' sponsors, advertisers and business partners makes sure to keep certain young, up-and-coming representatives (new blood), like myself, away from the public eye with their own overload of senseless and primitive content that throughout the years became the norm for 99% of the online crowd. Therefore, I would really appreciate all the support and help at this point. Thank you in advance! Please make sure to RT, repost and share our VIDEO PROJECT WITH MANY OTHERS!!! 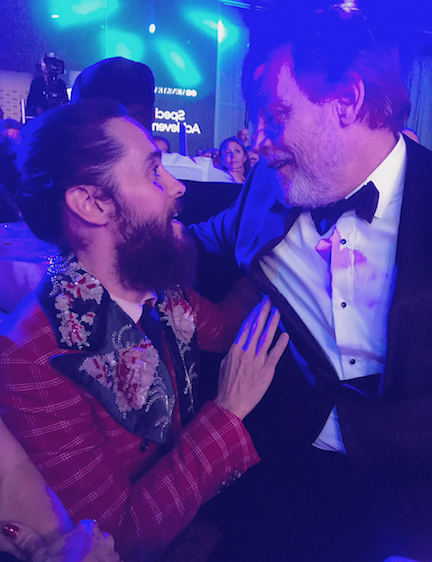 Update #1: Mr. Hamill unexpectedly (just like the Joker himself) showed up during our #BatmanDay-related discussion of the Joker TV Special project on Twitter and wrote the following: "Like all great actors @JaredLeto made the part his own! #Respect"
It's been a wild ride, dear ladies & gents! Thank you all for your active support and understanding! Wish we could've gone viral with his video project, but at least we have made a small difference and created something truly different, fresh and special. And so our great crusade comes to its natural conclusion. Since we are receiving so much active support and encouragement for our Joker TV Special, I decided that the time has come to finally share this personal footage of mine with all of you. It was the first time in my life when I was fortunate enough to meet Mr. Jerry Robinson (January 1, 1922 � December 7, 2011; an American comic book artist known for his work on DC Comics' Batman line of comics during the 1940s. He is also best known as the co-creator of Robin and the Joker and for his work on behalf of creators' rights) and interview him at great length for the Hollywood Reporter Magazine (International Edition) about the origins and the history of the Clown Prince of Crime at San Diego Comic-Con (July, 2011). As far as I am aware, this was one of the last interviews that Mr. Robinson gave in his life. 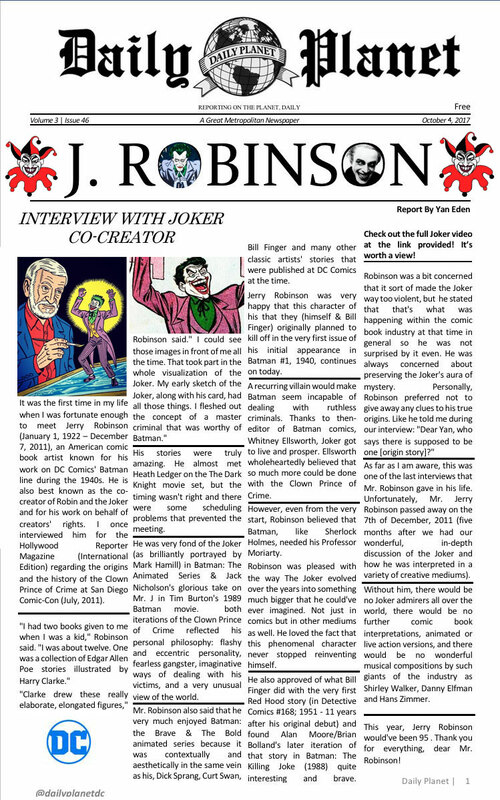 Unfortunately, Mr. Jerry Robinson passed away on the 7th of December, 2011 (five months after we had our wonderful, in-depth discussion of the Joker and how he was interpreted in a variety of creative mediums). Without him, there would be no Joker admirers all over the world, there would be no animated or live action versions of him, and of course, there would be no wonderful musical compositions by such giants of the industry as Shirley Walker, Danny Elfman and Hans Zimmer. * Charlie Schlatter (the voice of the Flash in a lot of WB shows, including Justice League Action), James Tucker (of the Brave & The Bold Fame), Chris McKay (Lego Batman/Nightwing) and many other talented and well-respected creators & artists. 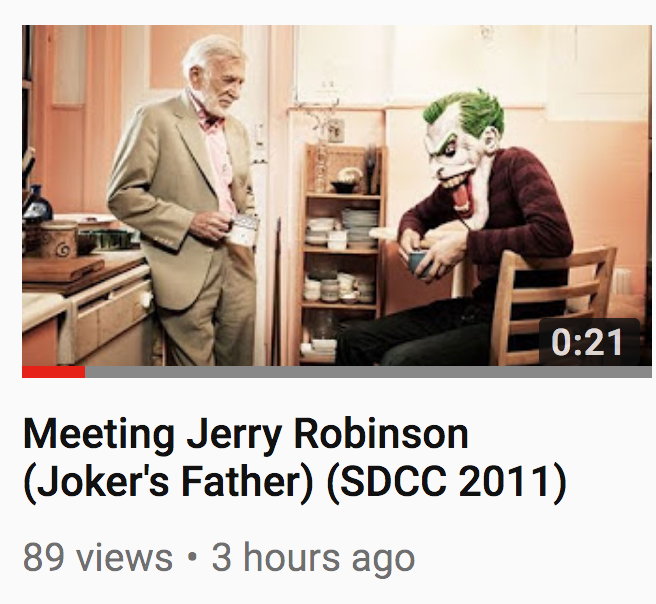 Just put out a new e-dition with @DailyPlanetDC on Twitter where I talk about meeting and interviewing the legendary Jerry Robinson (Joker�s father) for the first time and where we exchanged various thoughts about the Clown Prince of Crime.